In a sign that Egyptian-Italian relations are improving, the secretary-general of Egypt’s parliament, Ahmed Saadeddin, and Italy's ambassador to Egypt, Giampaolo Cantini, met on Monday evening to discuss preparations for the expected visit of Roberto Fico, the speaker of Italy's Chamber of Deputies, to Egypt this month. Fico, a member of the opposition 5 Star Movement, was elected speaker of Italy's lower house of parliament (the Camera Dei Deputati) following general elections in March. A press statement said Saadeddin and Cantini had discussed the preparations for Fico's visit to Cairo, scheduled for this month. “Fico chose Egypt to be the first country outside Europe to visit following the conclusion of Italian parliamentary elections held last March," read the statement. The speaker’s visit will be the third such by a high-ranking Italian official to Egypt in a month. Foreign Minister Enzo Moavero Milanesi visited Cairo in August, the first such trip by a senior Italian official since the death of Italian student Guilio Regeni in January 2016. At the end of August, Italian Deputy Prime Minister Luigi Di Maio came to Cairo to hold intensive economic talks with Egyptian officials. Tarek Radwan, the head of parliament's foreign relations committee, told Ahram Online that the expected visit by the parliamentary speaker coming so soon after Di Maio sends a new signal that the relations between Egypt and Italy are fast improving. The visits "show that the ties between the two Mediterranean countries are quickly recovering from a period of strain that was caused by Regeni's death and that they are now back on a sound track," said Radwan. In a statement following his meeting with President Abdel-Fattah El-Sisi and Prime Minister Mostafa Madbouly, Di Maio told the media on 29 August that "Egyptian-Italian relations are deep and historic, and that Italy has sincere intentions to boost ties with Egypt in all fields." For his part, Madbouly said Italy is Egypt's most important economic partner at both the international and European levels, and that Egypt is looking forward to cooperating more and more with Italy in all economic sectors. Di Maio, however, said Italy hopes for a breakthrough by the end of this year in the investigation into the tragic murder of Italian student Giulio Regeni in Cairo in January 2016. Regeni disappeared on 25 January while conducting postgraduate research on trade unions in Egypt. His body was discovered on 3 February, and Egyptian investigators found signs of extensive torture. "I hope by the end of the year we can get a breakthrough, and that the meeting of the judicial authorities investigating Regeni's death will take place as soon as possible," said Di Maio. Egypt's presidential spokesman said in a statement on 29 August that El-Sisi affirmed during the meeting that he is confident that Egypt and Italy will reach the final results into the investigation into the killing [of Regeni] in light of the strong will on the two sides to find the murderers and bring them to justice." After his meeting with El-Sisi, Di Maio said both El-Sisi and members of the government present were more than willing and in agreement that the truth about Regeni's death should be established “as soon as possible." Radwan said the flurry of visits of senior Italian officials to Cairo and the recent boost in economic relations between the two countries come to reflect a growing recognition by Italy that Egypt is doing its best to uncover the truth about Regeni's murder. "I think that Italian officials also are aware of the importance of Egypt as an active business centre for Italian companies and tourism, a main partner in fighting terrorism and illegal migration, and of its vital role in security and stability in neighbouring Libya," said Radwan. Radwan expects that talks between parliament speaker Ali Abdel-Aal and his Italian counterpart will focus on economic relations and legislation necessary to stem the tide of illegal migration across the Mediterranean. 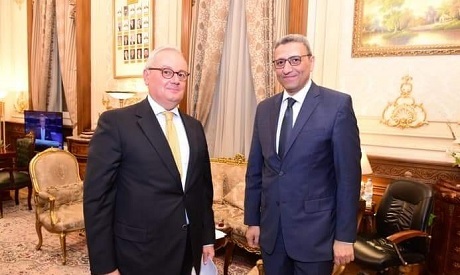 Abdel-Aal met with Fico in Rome in July, and invited him to visit Egypt “to discuss mutual Mediterranean issues between Egypt and Italy in the fields of terrorism, illegal migration, investment and trade," said Radwan.